Buy Backgammon and PriceWatch, Buy this board game at the Lowest Price. The game board is divided into four parts with each player having both an "inner table" and an "outer table". Each table is divided into six "points" with alternate colors three each. Note also that the points of opposing tables are of contrasting color. Each player must move his men according to the numbers shown on the throw of two dice. He moves his men from his opponent's inner table along the playing board, across to his outer table, and finally into his own inner table. The dark and light pieces move in opposite directions, as shown on diagram "B". 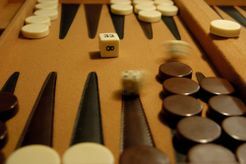 The laws of backgammon say that each player throws one die in order to determine who goes first. If both players roll the same number they must throw again until one player has rolled the highest number. That player then goes first, using the numbers shown on the two dice-his own and his opponent's. The players then throw in turn using their own dice. A player moves his men according to the numbers shown on the dice. Cocked dice means that one of the dice has not landed completely flat on the playing board. When this happens the player must throw again. The numbers shown on the dice are considered individually and not in sum total. Thus, a player may move one man the whole throw as long as the points designated by EACH die are open, or he may move each of the two numbers with different men. A player MUST use both numbers of each roll whenever possible. If he can use only one number, he must, if possible, use the larger. If he cannot move at all play passes to his opponent. Doublets merely means rolling doubles, the same number thrown on both dice. When this occurs you move the number shown on one die four times. You can move the same man all four moves, or any other combination of men you choose. Any point on the playing board on which two or more men of the same player sit. The opposing player's men may not land on a blocked point, however they may move over the blocked point. Once a player has landed two men on any one point he is said to have "made the Point". There is no limit to the number of men one player may have on a point. Any point on which a player has only one man. Since men of opposite colors cannot occupy the same point, when an opponent lands on a blot he removes the man that was there and replaces it with his own. This is then called a "hit". The removed man is placed on the bar. See diagram 1. The bar is the middle strip that separates the inner and outer tables. Once one of your men has been placed on the bar you must throw the dice when your turn occurs and you must enter into your opponents inner table BEFORE you may move any of your other men. Entering is accomplished by moving the man on the bar to the point indicated on either one of the die thrown as long as that point is not blocked. If you cannot enter because both points indicated are blocked the turn then passes to your opponent. See diagram 2. A SHUTOUT or CLOSED BOARD occurs when your opponents inner table is completely closed (each point is covered by at least two men). Bearing Off means removing your men from the playing board by the roll of the dice. You cannot start bearing off until ALL 15 of your men are in your inner table. You may then either bear off men from points corresponding to die thrown or you may move your men within your inner table according to the numbers shown on the dice. You must use your entire roll, if possible. This means that if you roll a six, but have no men on your six point, you must take a man off the highest point which you do have men. The same rule applies if you roll doubles. However, you cannot bear off a man if the point indicated on the die is vacant and there are any men on a higher counting point. If while bearing off, a man in your inner table is "hit", that man goes to the bar and must reenter as described earlier. You cannot continue to bear off until you have managed to get this man who was "hit" back into your inner table. The doubling cube is used to double the betting stakes. Before the game begins the doubling cube is placed on the "bar", with the number 64 on top and not facing either player. If there is an automatic double the number 2 is placed face up, again not facing either player. If there is a second automatic double the number 4 is placed face up, and so on. Automatic doubling occurs on each tie in the opening throw. Voluntary doubling means that a player offers to double the stakes, when it is his turn to play and before he has thrown the dice. A double may be accepted or declined, but the player declining looses whatever the stakes were before the double was offered. Thereafter, doubling alternates between players. A game is won when either player bears off all of his men first. A gammon (double game) is won if your opponent has not born off any of his men. A backgammon, (triple game) is won if your opponent has not born off any of his men and has one or more men in the winner's inner table or on the bar.